Where do I use my Virgin Media voucher code? Copy your code from NetVoucherCodes and click through to Virgin Media. Choose your bundle or service you would like and check the order details. Enter your code into the ‘Promo Code’ box and click 'Submit’. Your discount will be added to the total cost of your order, click 'Buy now' to complete your transaction. Virgin Media offers a comprehensive home media service, providing packages that include landline, mobile, TV, and broadband, as well as individual services. Virgin Media Phone landline talk plans all include calls to landlines, 0870 and Virgin Mobile numbers, and there are also options for various configurations, as well as extra calling features like ringback when free, caller display, voicemail plus, call waiting and more. Virgin Media digital TV offers a range of TV packages that include TV on demand, HD content and 3D-ready connections, with access to popular Sky channels like Sky Movies, Sky Sports, Sky Entertainment and On Demand as well as Virgin pay-per-view movies, catch-up services like BBC iPlayer, 4oD and more. As well as these two impressive services Virgin Media also offer superfast broadband for your whole house. You can find deals on all these packages, including broadband, on the Virgin Media website and here at NetVoucherCodes. Virgin Media is the fastest, widely available broadband provider in the UK. Their super fast and reliable broadband has earned several commendations from Ofcom for their impressive download speeds, clocking in at well over the UK average. With cable connections ranging from 50mb up to 200mb, with unlimited downloads and no hidden caps, you are guaranteed a brilliant wifi connection when browsing online, streaming and gaming. If you’re not in an area covered by cable, you can still enjoy phone line broadband through your landline connection. And if you shop online you’re eligible for special offers, allowing you to save up to £100 when you grab a multi-service collection. With wireless routers and free service & repair available at Virgin Media, everyone in your home can be online at the same time, and you can remain confident that you have full technical support on hand in case something isn’t quite working. 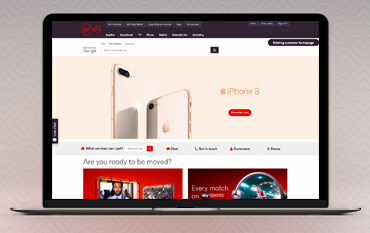 Not only do Virgin Media offer superb broadband, TV and phone bundles and deals, they also offer great mobile services, enabling you to stay connected wherever you go. Stay online all the time with Virgin Media’s flexible pay monthly mobile 4G plans. Virgin Media’s pay monthly mobile plans come with features you’ll adore, including data rollover that allows you to keep unused data and data free messaging on Whatsapp, Facebook Messenger, and Twitter. As well as this you can also change your 4G plan up and down every month and enjoy F-Secure SAFE internet security for 12 months. All 4G mobile plans also come with 99% 4G coverage, free wifi at 2 million+ hotspots and roaming abroad in 43 destinations, with no added cost. Discover all the latest mobile phones and start your pay monthly contract today, or opt for a sim only or pay as you go deal which also offers great devices at low-cost prices, with tonnes of added extras. Get your order delivered at no extra cost. Virgin Media can deliver to anywhere in the UK. They always aim to deliver the next day (excluding Sundays and UK Public Holidays), but you can also choose a delivery day up to 21 days in advance. Virgin Media’s 14-day Customer Satisfaction Guarantee lets you exchange your phone or mobile broadband data device for a different one of the same value or get a full refund, minus any airtime or data you've bought. They will even send you prepaid packaging to post it back. For a refund, return it ‘as new’, in its original packaging, with proof of purchase. Use the Store Locator to find your nearest Virgin Media store and its opening times. You can also seek customer service help online here. Virgin Media offer TV, Broadband, Phone and Mobile - all from one place. Snap up one of our fantastic Virgin Media Promo Codes and get a great discount on your package! At Virgin Media all your entertainment is in one place with their TV packages filled with amazing channels and apps, broadband up to 200Mbps, and home phone. Virgin Media bring the best of TV together, no matter where it comes from including the channels you love, Netflix, YouTube, TV on the go with Virgin TV Anywhere, Box Sets and Virgin Media Exclusives. We are constantly on the hunt for first order Promo Codes for Virgin Media to help you with your money saving. Our experts check dozens of sites for secret codes including NHS discounts, student sites & social media channels saving you time & money!